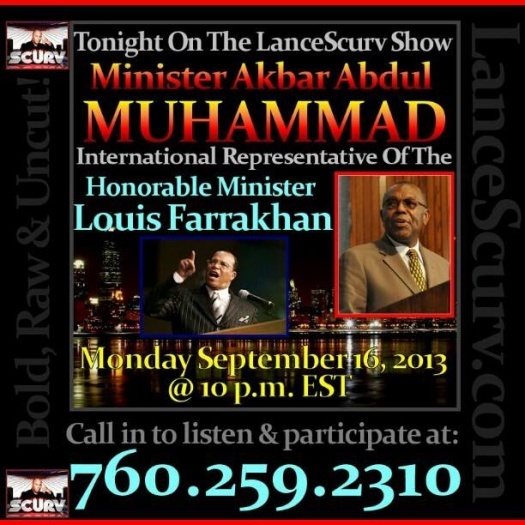 Tonight we have with us a very special guest, a man who has dedicated his life to the liberation of our people the world over, he is our Brother Teacher and Guide as the International Representative of The Honorable Minister Louis Farrakhan and The Nation Of Islam. The Honorable Dr. Akbar Abdul Muhammad. Too many of us are so foolish to reject a word that will bring life and restoration to the world merely because their manner of worship doesn’t resemble theirs. If in fact we truly seekers of the truth and worshipers of the one true God, then this world wouldn’t be in the mess that it’s in and we would be rid of the indoctrination and mind control that we absorb so quickly that has brought us into our own private hells. When the Trayvon Martins of the world are stalked and killed for no more than an abundance of melanin possession, those demonic hellbent entities never pick and chose to see if they are Muslim, Christian, Catholic or and atheist. So in our divine love for each other, our manner of worship shouldn’t matter either because we all come from the same essence! I invite everyone here to open their mind to hear what our Brother here has to share without the automatic rejection that seems to be the norm that has been placed inside of many of you by your hateful oppressor who does not ever want you to be set free! I pray that God blesses everyone here and that this time finds you in good heath and prosperity and all I ask is that you share the dynamic word of Brother Akbar Muhammad to the masses via your favorite social media platforms. Previous : It’s Not ALL Of My Black Sisters, But Far Too MANY Of Them! Next : The Aaron Alexis Shootings: Are We Our Brothers Killer Or Keeper?